This is my second post for today so if you are looking for my HHH post, please scroll down. TESSA! Random.Brady picked your name to be the Autumn Russell winner! YAY! 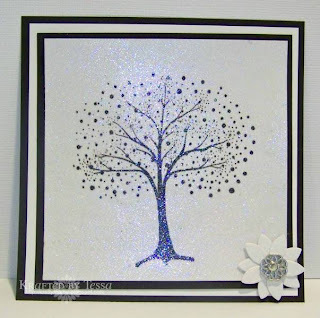 I love this sparkly tree card! It's absolutely stunning! And the flower with that pretty hardware is just gorgeous! Awesome job Tessa! Please email me (actressangel at gmail) with your address and what print you'd like from the Autumn Russell shop. You can pick anything that is up to a $55 value. Have fun! THIS IS simply beautiful!!!!! LOVE IT! Love that shimmer paper! Beautiful card from Tessa! Congrats! This is a great card from Tessa a real winner even non Brady.org! I love all the shimmerz! I can not wait for the announcement tomorrow because I am going to play in this weeks Etsy Shop Challenge. It is a goal I set for myself! love the card! yay for Tessa! :) I can't wait for the next challenge!! woo hoo! Thanks for all your hard work Ashley! YAY! Thank you Brayden!!! I am so excited!